Opening times Mon–Sat 7.45am–4.30pm; Sun 9.45am–3.45pm. Books & Beans is a modern, colourful secondhand bookshop, which turns the dusty stereotype on its head. Downstairs, Aberdeen's first independent Fair Trade café offers freshly made soups, salads and sandwiches as well as great coffee. Its short, strong ristretto is guaranteed to prevent you from falling asleep over your book. Upstairs, cosily packed shelves with everything from chick-lit to Chekhov. 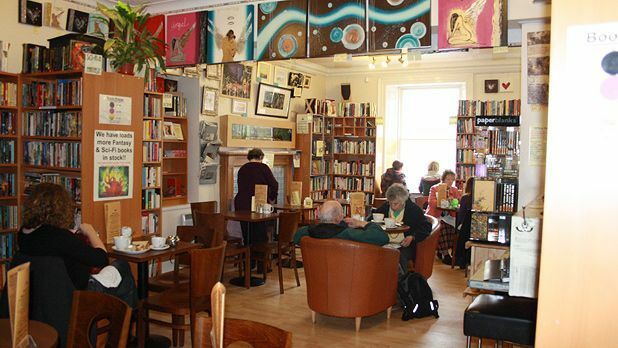 Books & Beans is a modern, colourful second-hand bookshop, which turns the dusty stereotype on its head. Downstairs, Aberdeen's first independent Fair Trade café offers freshly made soups, salads and sandwiches as well as great coffee. Its short, strong ristretto is guaranteed to prevent you from falling asleep over your book. Upstairs, cosily packed shelves with everything from chick-lit to Chekhov. Books and Beans serves all day lunches and snacks. Upstairs we’ve also got Aberdeen's only Internet Café offering faxing, printing and free Wifi. Monthly poetry reading and open mic night. Audience members are encouraged to bring a poem to share. Featuring poet and translator Alasdair Gordon. Looking for events in Aberdeen?